Oil and gas business activity in Texas and neighboring states was roughly unchanged in the fourth quarter after 10 straight quarters of gains, a Dallas Fed survey shows. Following an oil price collapse, executives in the region think U.S. crude will end 2019 at $59.97 on average — lower than 2017's closing price. Company sentiment turned negative for the first time since the first quarter of 2016, when oil prices hit 12½-year lows. 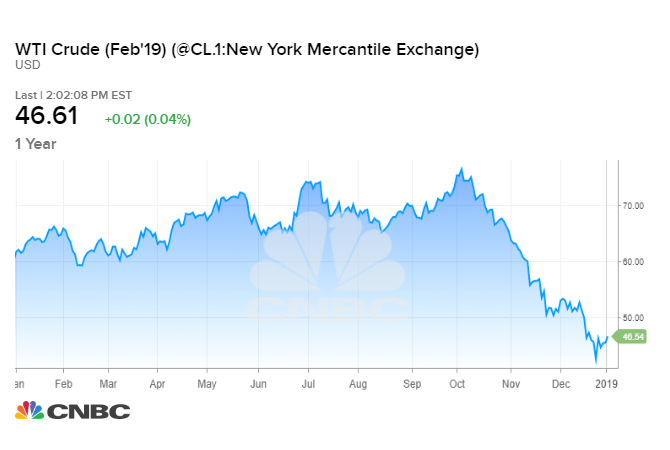 The survey from the Fed's 11th District also showed company sentiment turned negative for the first time in nearly two years and executives don't expect much of an oil price recovery in 2019. The insight is from the Dallas Fed's latest quarterly Energy Survey, which comes on the heels of a nearly 40 percent plunge in U.S. crude oil prices to about $45 a barrel in the final quarter of 2018. The oil market has been hammered by fears of growing oversupply and slowing economic growth that could weigh on fuel demand. One of the key findings in the survey shows that oil executives think U.S. crude prices will end 2019 at $59.97 on average. That would mark a fairly moderate recovery -- U.S. trade in crude ended Thursday at $47.09. The Fed's 11th District includes Texas, northern Louisiana and southern New Mexico and is home to the nation's top shale oil region, the Permian Basin. Rising output from the Permian has helped push U.S. production to all-time highs above 11.5 million barrels a day, making the United States the world's biggest producer. The Dallas Fed survey's business activity index, a broad measure of conditions impacting the region's energy firms, plummeted from 43.3 points in the third quarter to 2.3 points in the fourth quarter. That means activity was largely unchanged following 10 straight quarters of increased activity.